Corporate data is constantly at risk of loss, theft, and exposure. 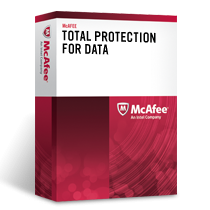 The McAfee Total Protection for Data solution suite protects your data using a combination of powerful encryption, access control, and user-behavior monitoring. It helps you establish and enforce a data protection policy and centralize data security management using McAfee ePolicy Orchestrator (ePO) software. Control how employees access, use, and transfer sensitive information via common channels, such as email, IM, printing, and USB drives. You stay in control of your data protection whether users are in the office, at home, or on the move. Stop data loss initiated by Trojans, worms, and file-sharing applications that hijack employee credentials. Secure data when it's stored on desktops, laptops, tablets, and other mobile devices. You control which specific file types and folders are encrypted. Use advanced reporting and auditing capabilities to quickly and easily demonstrate security compliance to internal and external auditors, board members, and other key stakeholders.